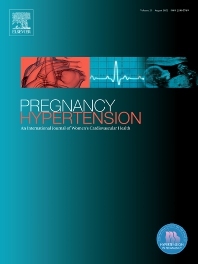 Pregnancy Hypertension: An International Journal of Women's Cardiovascular Health aims to stimulate research in the field of hypertension in pregnancy, disseminate the useful results of such research, and advance education in the field. We publish articles pertaining to human and animal blood pressure during gestation, hypertension during gestation including physiology of circulatory control, pathophysiology, methodology, therapy or any other material relevant to the relationship between elevated blood pressure and pregnancy. The subtitle reflects the wider aspects of studying hypertension in pregnancy thus we also publish articles on in utero programming, nutrition, long term effects of hypertension in pregnancy on cardiovascular health and other research that helps our understanding of the etiology or consequences of hypertension in pregnancy. Case reports are not published unless of exceptional/outstanding importance to the field.